The support staff with Guthrie Public Schools were reminded Friday morning how much they are appreciated by the public and school officials. 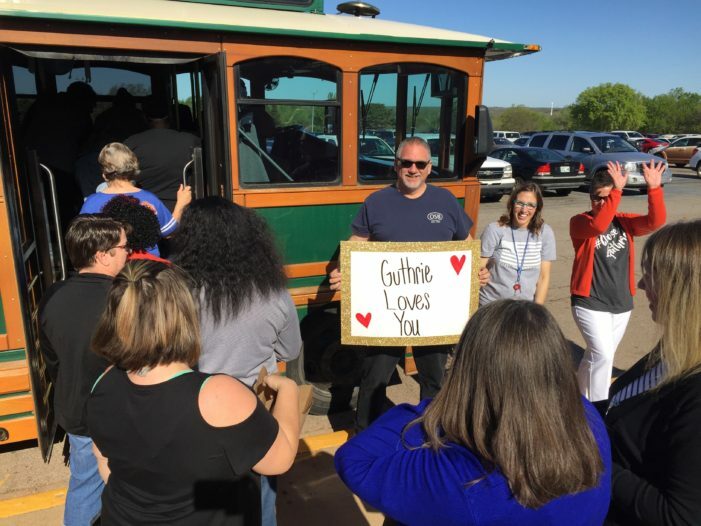 The Guthrie Chamber of Commerce, along with community members and school administrators, took the trolley to each school building and showed their appreciation with cheers, signs, thank you’s, drinks and an abundance of snack foods. The plan was simple by the Chamber’s Education and Workforce Committee, but a sincere heartfelt thanks was felt for all the efforts the support staff does to ensure things run smoothly for the school system. With each stop, cafeteria workers, janitors, teachers’ aides and secretaries were greeted with signs and cheering from chamber investors and board members. The support staff went onto the trolley where it was stocked with snacks and drinks.